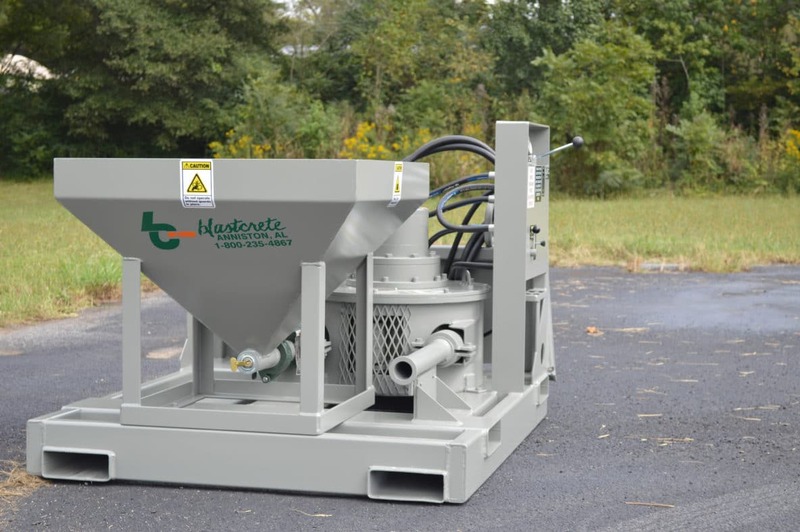 ANNISTON, Ala. (Dec. 4, 2014) The D3522 Attachment from Blastcrete Equipment Company is the only hot epoxy pump on the market that can be powered by an existing hydraulic power source. It is lighter, more versatile and much more affordable than hot epoxy pumps and mixer/pump combinations with built-in power supplies, especially since skid steers and other equipment with auxiliary hydraulic hookups can power the unit. The D3522 Attachment features a hydraulic squeeze (peristaltic) pump that is built for long life and low total cost of ownership. The pump has two rollers that rotate clockwise and squeeze a 2-inch rubber pumping tube. The rotation generates suction from the receiving hopper and pushes the material through the pump and out the discharge into the delivery hose. The epoxy materials do not come in contact with the moving parts of the squeeze pump, unlike a rotor stator or piston-style pump. The D3522 Attachment’s primary wear part, a 2-inch rubber pumping tube, can be replaced in 20 minutes or less. The D3522 Attachment can pump hot epoxy or cementitious grouts at variable speeds from 0 to 6 cubic yards per hour and deliver up to 400 psi of pumping pressure. Those capabilities, coupled with the unit’s light weight, make it easy to transport and highly versatile. Contractors can use the pump for a wide variety of applications, such as grouting to mount and secure heavy industrial equipment and pumping fiberglass jackets for pier rehabilitation and stabilization. The D3522 Attachment also can be used for spraying plaster and small wet-shotcrete applications. The unit boasts a variety of safety features to protect the operator. For example, if the pump becomes plugged, the operator can easily reverse the pump for 5 seconds to relieve pressure on the delivery hose. Blastcrete designed the D3522 Attachment for easy operation. The unit has a large, well-marked control panel with simple control levers to operate the pumping function. The control panel is near the hydraulic hookups for easy access. The D3522 Attachment also is easy to clean and maintain. After the unit has been emptied of excess material, contractors can rinse the hopper with water and insert a round sponge ball into the suction hole of the pump. The hopper is then flooded with water or other solution for cleaning epoxies. The ball is simply pumped through the pump and delivery hose to ensure it is clean and clear.